Would you believe it's been a year, to the week, of the Blackhawks capturing the most famous trophy in all of professional sports? To remind you what Vancouver and Boston are playing for, here are a couple new photos from Patrick Kane's time with the Stanley Cup. These date back to last August, when Kane brought the Cup home. The bald gentleman in both photos is an officer with the Buffalo Police Department, and decidedly on duty in one of them. We're not criticizing Kaner for partying, and in fact we never have (despite the shitstorm his photos always seem to cause when we post them). 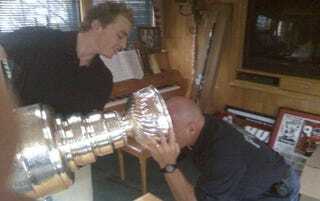 No, consider this more of a warning: Lord Stanley be filthy. Did Patrick Kane Have A Two-Day Hangover?